The 2014 San Diego Comic Con is almost upon us. 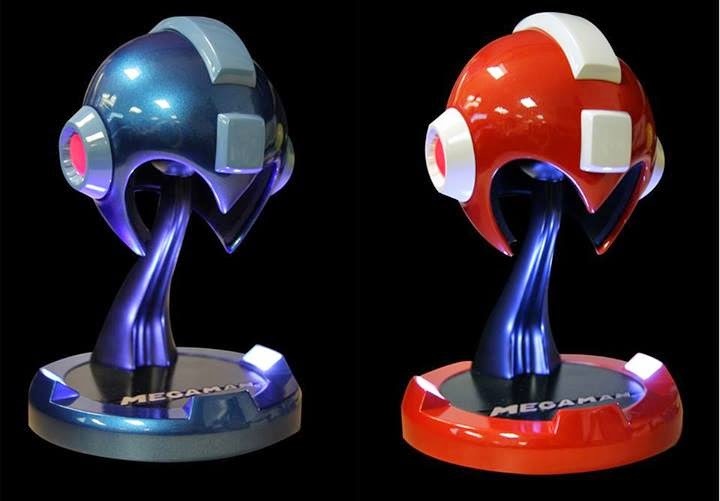 And if you are fortunate enough to be attending, you'll be pleased to learn that Capcom are debuting a sweet pair of replica Mega Man helmets (made out of chrome resin, no less). According to Brett Elston, these guys stand at 10'' and about 5'' inches wide. Classic blue and red/white colors will be available for purchase at Capcom's booth (215). Much like the 25th anniversary statue of SDCC past, these light up with the aid of a USB cable. If you can't make it out to the show, Brett says there will be other opportunities to nab 'em up later. The red/white variant, however, has limited availability. There's a higher chance on that one selling out before it's blue brethren. The sooner you get it, the better. If you're interested in checking out other swag on sale at Capcom's booth, check out this post here. SDCC kicks of July 24th! Wow! Those are better than the statue! Wow...more offical merchandise,this is so awesome than at least release one game eh? Well, things like this make Capcom a pretty penny. It's why they've been doing it for years now. Shiny! I really like how those helmets turned out. MEGAMAN MERCHANDISE!?! KILL IT WITH FIRE!!! Don't want merchandise! Want new games! Waaaaaaaaaaaahhhh! If only they were wearable helmets, that would make it awesome.